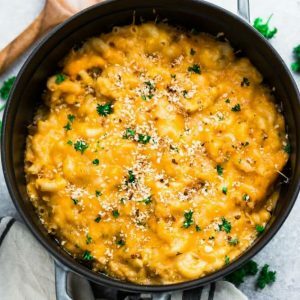 Easy, homemade Macaroni & Cheese made all in one pot in under 30 minutes on the stove. In a large heavy pot or dutch oven, melt butter over medium heat. Whisk in flour and continue to whisk and cook for 1 minute to create a roux. Whisk about 2/3 cup of milk and continue whisking - it will thicken up pretty quickly. Continue to whisk in remaining milk until smooth. Then add water, salt, black pepper, and seasonings. Pour in uncooked macaroni and continue stirring occasionally as it heats up and starts to boil. Lower heat and allow to cook for 11-13 minutes, stirring regularly. Once the sauce thickens and the macaroni is just cooked and tender, turn off heat and stir the cheeses in quickly. (The sauce thickens and reduces considerably after adding cheese). Remove from heat and adjust seasonings by adding more salt, black pepper, and other seasonings to taste. Stir in toasted panko crumbs or any optional add-ins and serve immediately with fresh parsley. (Or feel free to toss under the broiler or in the oven for a few minutes for an extra crunchy crust). **Feel free to use any combination of cheese you like or just use all ONE cheese if that's what you prefer. I would suggest extra sharp cheddar or something with more flavor and bite if only using ONE cheese. *This recipe is pretty forgiving as long as you continue to stir the pasta as it cooks and allow the sauce to thicken and get creamy. * The sauce thickens ALOT after you stir the cheese in and remove from heat. Continue stirring until mixed in and creamy. * If you take the pot off too late and the sauce becomes too thick, just add a splash of milk or water. * If you take it off too early, just return the pot back on the stove.